The young and handsome Duke of Barenlock is twenty-seven and is being constantly pestered by his mother and his family to get married. They are not only frightened he will not produce an heir to the Dukedom, but the Castle, one of the most famous in Scotland, is in desperate need of repair. The Duke’s cousin Moira introduces him to an attractive American girl, Mary-Lee, who is an immensely rich heiress. Moira tries to pressure him into proposing to Mary-Lee, but he is idealistic enough to hope that one day he will fall in love with someone who will love him not for his title but for himself. To escape the pressure he goes for a walk by his river, which he shares with his Clans’ arch-enemies, the MacFallins. He sees a poacher in the shape of a young girl fishing his water and he is just about to order her off when she hooks a salmon and he cannot resist netting it for her. 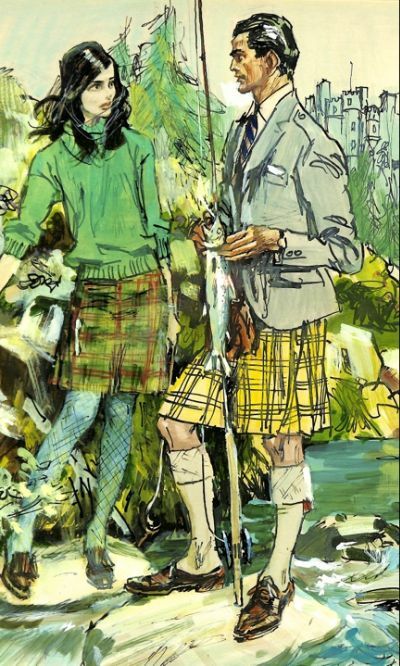 It is her first salmon and she is so delighted that he finds it hard to tell her she has no right to it and he then discovers that she, Sheinna, is the daughter of the dreaded Chieftain of the MacFallins. They agree to meet the following morning at the same place and Sheinna tells him that her father is forcing her to marry Sir Ewen Kincard, who is over seventy with a terrible reputation. How the Duke and Sheinna find a way together to resolve their problems and bring their Clans together, and how after severe danger they find real love for themselves is told in this exciting and stirring story of Scotland by BARBARA CARTLAND.